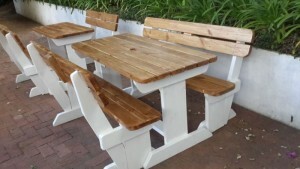 Wooden furniture, Outdoor benches, Patio benches. -African Wooden Benches and Tables are constructed with the utmost care, the best SABS approved materials and the sturdiest design possible. 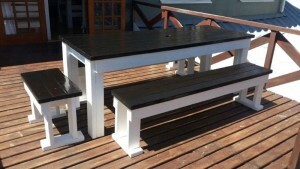 -They are GLUED and SCREWED ensuring that our Benches & Tables are durable and steadfast. – Exterior U.V. Repellent I used to seal, all products are treated and sealed with 4 coats of it. -The tops and seats have four to 8 supports (this varies depending on size the whole structure), warping and distorting due to constant exposure to the weather elements is greatly reduced. -Non-traditional diagonal supports to the table top are also available to provide and enhance extra sturdiness so that the bench does not become loose and shaky over time. -The Non-traditional footrest is provided for a sturdy guide for an umbrella, providing such there is no need for heavy umbrella base on the wooden furniture.